The Engadin Mountains near St. Moritz in Switzerland are among the most dramatic in all of the Alps. No wonder, the rich and famous have chosen it for their playground! The Engadin Valley itself is an elevation of at least a 1000 m. Many parts are higher, including the town of St. Moritz. Glacier-capped peaks and iridescent blue lakes make for dramatic scenery. It makes an excellent base for exploring the Engadin Mountains. You’ll find yourself surrounded by 3000 – 4000 metre high peaks, and an incredible 172 glaciers! Evidence of a recent glacier past. The unspoilt landscape is one of my favourite in all of Europe. Narrow ridges, glacier-covered peaks, iridescent high alpine lakes, and glacier-swept landscapes, make for some high drama! Not to mention that it’s capped off with 300 days of sunshine each year! The other thing I love about the Engadin Mountains is that although they are high alpine, they are accessible to everyone thanks to gondolas and trams that you can take up. The views from views from Muottas Muragl are fantastic – and only get better and better with a little effort. 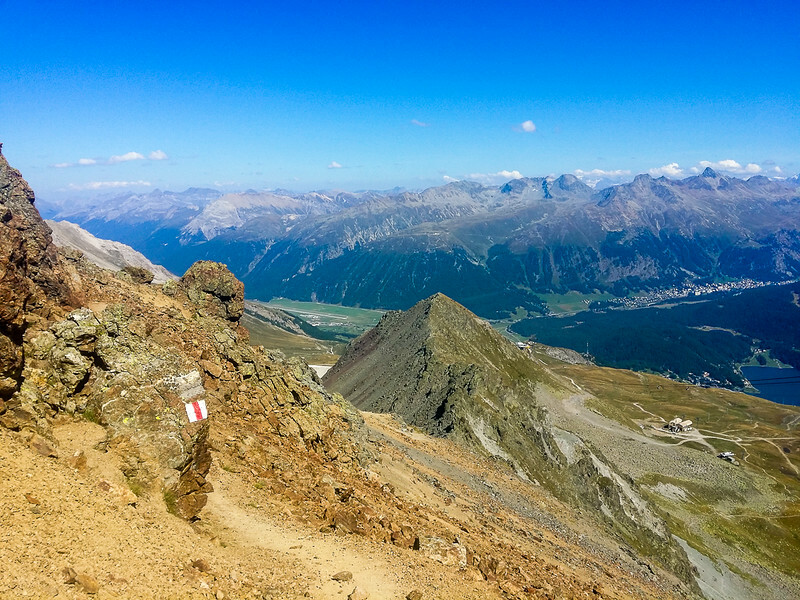 At the top of the tram stations, you can enjoy the view at a restaurant, do an easy hike, or challenge yourself with a real mountaineering adventure! All of the best-known peaks in the Engadin are famous for their mountaineering stories. Especially Piz Bernina, the highest peak in the Eastern Alps at 4049metres. The first ascent dates back to 1850. And the stories have been coming ever since! 1) The Rhaetian Railway through the Albula/Bernina landscapes. It’s an accredited UNESCO World Heritage Site for its technical, architectural and environmental features. It’s only the third railway ever to be designated as a UNESCO site! 2)The Olympia Bob Run. Not only is the oldest bobsled run in the world at 125 years old, but it’s also the world’s only natural ice track that hosts international races. The Engadin Valley separates the mountain chains. If you feel the need for speed, you can experience the rush of going 130km an hour flying along the ice for CHF 250! Bobsled rides are usually available from mid-December to early March, depending on the weather conditions. 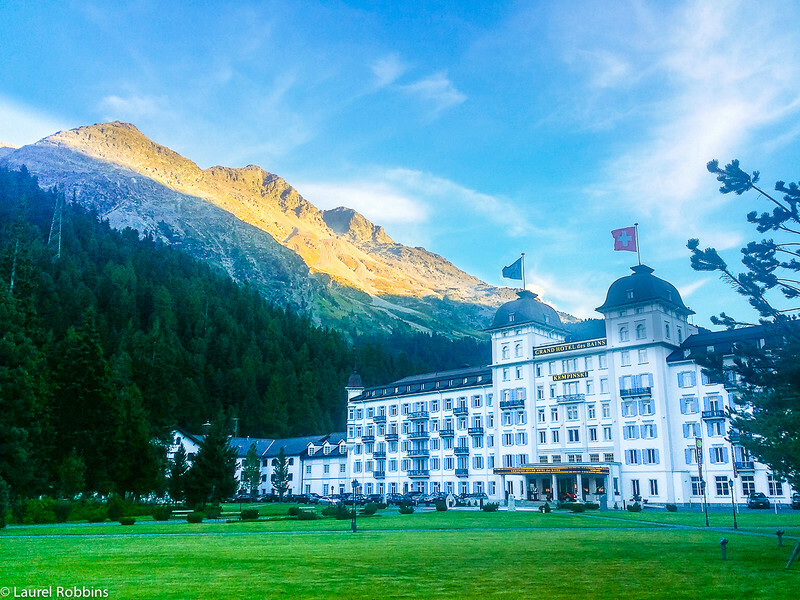 I stayed at the Kempinski Grand Hotel des Bains in St. Moritz. This is the place to stay when you want to feel like a princess and wrap yourself in luxury! Be sure to treat your sore muscles after a day of hiking with some spa time – I had an excellent massage which left me feeling refreshed. I was so impressed that it made my list of 10 of the Most Romantic Hotels in the World! I also loved the incredible breakfast! If I could eat breakfast every day for the rest of my life here, I would be delighted! 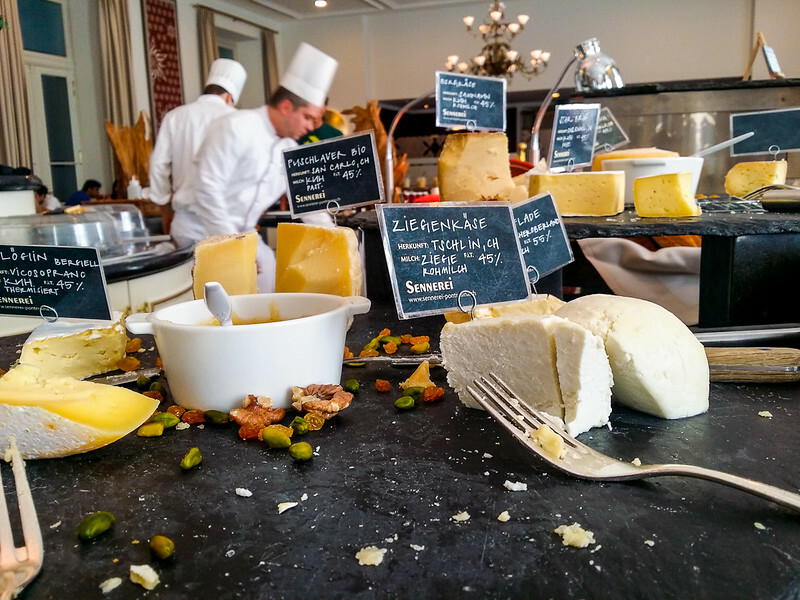 Breakfast at the Kempinski Grand Hotel des Bains. Colossal cheese selection as part of the breakfast offering. I loved the cowbell decorations in the breakfast room. Be sure to check out these other destinations in Switzerland! Note: Thank you to the Kempinski Grand Hotel des Bains for providing me with a complimentary stay. As always, all opinions expressed are my own.